What are the Nexus 7 Hardware Features? For navigating your way around the Nexus 7, you need specific directions. The first step to using your tablet is to know its’ hardware features. Knowing these hardware functions will help you navigate your way toward expertise! Power Lock: The Power Lock button appears on the upper-right side of the Nexus 7. It’s more toward the back of the tablet than on its side. You use the Power Lock button to turn the Nexus 7 on or off or to lock the touchscreen. Volume Up/Volume Down: To control the volume on your tablet, use the Volume button found on the right side of the Nexus 7. It’s one button but two switches. Press the top part to increase the volume; press the bottom part to lower the volume. Touchscreen: The biggest part of the Nexus 7 is its touchscreen display, which occupies a goodly chunk of real estate on the front of the device. The touchscreen display is a see-touch thing: You look at it and also touch it with your fingers to control the tablet. Speaker: The Nexus 7’s speaker appears as a long, thin slit that’s parallel to the bottom edge of the device, found on the back. Headphone connector: At the bottom right edge, just next to the USB / Power connector, you see a hole where you can connect standard headphones. USB / Power connector: At the bottom center of your Nexus 7, almost like a drain hole, is the USB / Power connector. That’s where you attach the USB cable to charge the tablet but also to connect to a computer for exchanging files. Four dots of mystery: Officially, it’s known as the 4-pin connector. The dots have no purpose, other than to distract you to the point of obsession. Most likely, they’ll be used in a docking station that Google may offer at some point in the future. Microphone: The Nexus 7 has two microphones, both of which appear as tiny holes in the case. One is found on the top, and the other on the device’s left side. 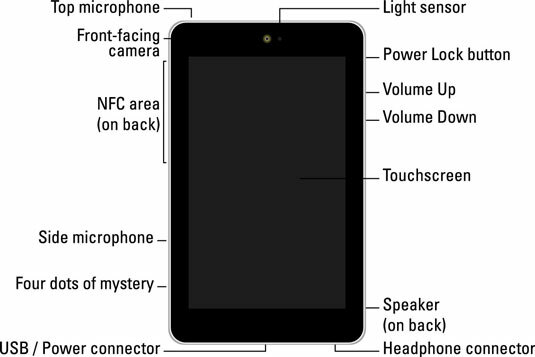 NFC area: Found on the upper back of the tablet (though not clearly identifiable), the Near Field Communications area allows the Nexus 7 to communicate wirelessly with other NFC devices. Front camera: The Nexus 7’s front-facing camera is centered above the touchscreen. The camera is used for taking self-portraits as well as for video conferencing. Light sensor: Though it’s difficult to see, just to the right of the front camera is a teensy light sensor. It’s used to help adjust the brightness level of the touchscreen. Don’t stick anything into the microphone hole! Yeah, it’s about the size of an unbent paper clip, so avoid the temptation. The only things you need to stick into the Nexus 7 are the USB cable and headphones. The Power Lock button cannot be accidentally pressed while the Nexus 7 is lying flat on a table. You have to lift the tablet before you can press the button. The “four dots of mystery,” or 4-pin connector, is similar to the three dots found at the bottom of the first Google phone, the Nexus One. On that device, they were used by a docking station or car mount.